Among all sedulous professionals and solenoid diaphragm valve supplier, we are counted as leading solenoid diaphragm valve manufacturer, supplier, and exporter in India. These diaphragm valves are used in areas of high pressure. Our each solenoid diaphragm valve is made with the use of premium quality raw material and manufactured using state of the art technology under the strict supervision of professionals. We are capable to provide solenoid diaphragm valve in different shape, size and designs. Because of their good quality and characteristics, they are highly appreciated among our customers. Solenoid valve is generally a one type of electromechanical device, where solenoid uses the electric current for generating magnetic field to operate mechanism. With the help of that mechanism, the solenoid valve can regulate the fluid flow in the valve. Solenoid valves differ in the various characteristics such as for using electric current, the strength of magnetic field generated by them and type of their mechanism to regulate fluid. The mechanism also varies on different actuators such as plunger type, rocker or pivoted actuators. The solenoid valve can use two, three or more port to regulate flows between different ports. These are most used control devices to regulate the different type of fluids. Their application areas are larger and wider and they are used to release, distribute, mix or shut off fluids. They can offer safe, fast and high reliability with a long life of service and require low power for control. Solenoid diaphragm valve consist a small rubber diaphragm which moves in the upper and lower direction in the body for opening and closing operation by changing the stage of the solenoid valve. There is small orifice situated in diaphragm valve, it allows water to flow to a chamber near the diaphragm. Light spring loaded metal piston controls the whole movement. Indirect acting diaphragm valves, the operation of opening and closing is depended on the solenoid coil. Once the solenoid coil is energized properly, it simply changes its stage. While in the indirect solenoid valve, the pressure of the fluids influences the position and stage of the valve. To suit any application and process flow, Solenoid diaphragm valves are available in a wide range of variety. 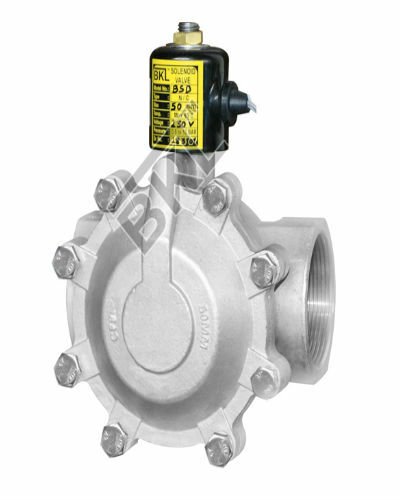 BKL controls are the expert solenoid diaphragm valve supplier to suit your various industrial applications. We will understand your application, requirement and budget before suggesting the correct valve for your use. Please contact BKL controls team for more information and suggestion for your varied application.